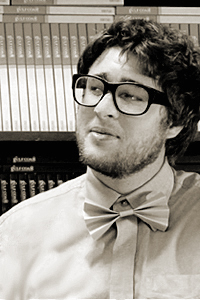 Joshua Gottlieb-Miller’s work has appeared or is forthcoming in Indiana Review, The Journal, Birmingham Poetry Review, The Laurel Review, Linebreak, and elsewhere. He was the winner of the 2012 Indiana Review Poetry Prize and the 2012 Inprint Marion Barthelme Prize in Poetry. He has received scholarships and fellowships from the Sewanee Writers’ Conference, Vermont Studio Center, Bucknell Seminar for Younger Poets, and the Virginia Center for the Creative Arts. He earned an MFA in poetry from the University of Houston, where he was a poetry editor for Gulf Coast.